Jul 18, 2017: Replacing internal hd with ssd, what external hd to use? 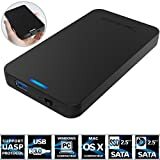 Jan 25, 2018: I bought an external SSD for pubg and it makes it way better! Jan 31, 2018: USB 3.0 Drive Enclosure for HDD and SSD? Feb 05, 2018: I was SCREAMING at my tv. Hopefully this is fixed soon! Apr 18, 2018: PSA: SSD Drives for MUT is AMAZING! May 17, 2018: I just got a SSD for the OG Xbox one and don't have any improvement. Any suggestions? Nov 27, 2018: What's the best affordable ssd for Xbox One to help PUBG load? Nov 27, 2018: Anyone else not have 90% of the issues everyone on this sub seems to have? Nov 27, 2018: If you've been thinking about getting an SSD but have been holding off, here's your chance for under $50! Nov 30, 2018: Looking to buy a 2.5 inch drive enclosure. Dec 18, 2018: Hey what is the minimal ssd set up I can buy to make this game a little better? Dec 29, 2018: SSD help. Feb 03, 2019: Will this enclosure definitely work for this SSD? Feb 05, 2019: 1X user purchased an SSD just to test the difference. Feb 07, 2019: New SSD makes a HUGE difference!!! Feb 19, 2019: SSD help! Feb 22, 2019: What can I do to fix my laptop?